Y’all know how much we love our pets – but I will say that Springtime can be one of the most frustrating parts of the year with them. Why, you may ask? Because Spring means muddy paws – which then get tracked in all over my floors! Add to that the fact that they’re bringing in all that pollen or other plant stuff as things begin to grow, just adding to the mess. Luckily it’s not really a big deal, because I can clean it up super easy with my arsenal of supplies. Some of my dogs get the ‘what ME?’ look when I jokingly ask who left all the muddy paw prints – but some of them couldn’t care less! At least I don’t have to stress about it, and can just ask one of my kiddos to nab our Swiffer Sweeper to wipe it up quickly. And who here has pets that LOVE laying in the window areas in the springtime when the sun shines in nice and warm? I have a few that will hang out in the sunny spots constantly – meaning more of their shedding gets left behind. Another fun tool in our cleaning arsenal is our Swiffer Dusters Heavy Duty Pet Refills – which is probably my family’s FAVORITE cleaning tool! I mean, they get a ‘wand’ of fluffy cleaning-ness to go ‘trap’ all that hair and dirt left behind. Swipe it around on the ledges or wherever your pet tends to chill out, and it grabs all the fur up quickly. Check out everything it got up from just ONE swipe along this window seat ledge that my Leia girl loves laying in during the sunshine! Even though Spring means muddy paws, shedding and all sorts of other pet frustrations, you don’t have to worry about anything other than loving your pet thanks to a trusted supply of Swiffer products to help clean up the mess quickly, easily and even enjoyably! Check out items for your Swiffer cleaning arsenal! GUYS – I can’t even begin to describe how excited I am, because something I’ve been working on for a long, long time is FINALLY ready to share with you! After doing this site for over 5 years now, and all the feedback, questions and thoughts from fellow busy parents everywhere, I decided to do something that will truly be ‘Busy Mom’s Helper’. Ready for it? 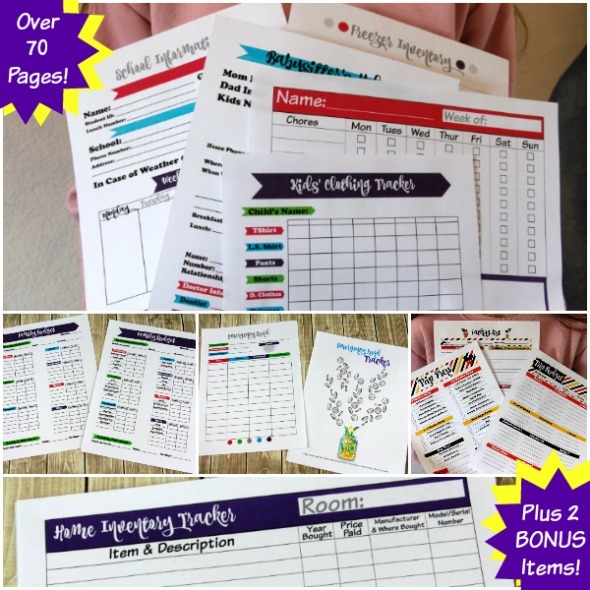 It’s a complete set of printables – we’re talking over 70 pages – that are designed with one purpose in mind: helping busy families! Taking into account many questions or requests from people as to what type of forms, paperwork, charts or lists would help them in their lives, I tried to do almost any of them that could benefit other parents struggling for more time, organization – or just plain sanity. If you’re ready to dive in and check out this extensive pack of printables for busy families, then here we go! Because one of the whole points of this printable set is organization, I’m going to list out all the amazing pages that are included under their basic ‘topics’ below, so you can search for the ones you’re most eager to see (or the ones that would help you the most). We have practically everything: Money & Financial, Kitchen & Meal Planning, Scheduling & Time Management, Security/Personal & Home Management, even some fun-but-helpful pages for Trip Planning! We could break these down into subcategories, but since people have varying opinions of which topic something may go under, let’s just stick with these larger categories for simplification reasons. pantry, fridge & freezer – keep a running list! broken down to store sections: aisles, dairy, meat/deli, produce, frozen & misc. such as doctors, dentist, etc. food, medicines, vet contacts, etc. start/end times, bus schedules, checking weather, etc. great way to save money – tips here! for those left behind to know where important things are – list for accounts such as banking or investments (blank and prefilled), as well as items such as address book and will (blank and prefilled) – be sure to keep in a very secure location, but where trusted ones know where to find it! to-do’s 6-9 months prior, 1-2 weeks prior, etc. As you probably noticed, several of the printables have both a BLANK and a PREFILLED option – we wanted to be the most help to the most people, so included the prefilled for those that really like having the most common things already there for them. However, we know many will vary in what they’d put, so made sure a blank form was still included. Like we said at the beginning of this post, we’ve been collecting input, ideas, and requests for a LONG time to see what type of printables would really be the most helpful for busy families – we tried to include as much as possible, and any that seemed to be requested by enough people to be seen as a common need. Did you see the two BONUS items, too?! We’re including our super popular ‘Unofficial’ Disney Autograph & Activity Book (our most popular printable EVER) as well as our extremely helpful (and probably our second most time-consuming project we’ve ever done) 52 Weeks of Meal Plans! That’s a whole year of breakfast, lunch & dinner planned out – including the budget-friendly recipes. I told you I wanted this pack to be as helpful as possible for fellow busy parents, so felt that it wouldn’t be complete without these two great resources! And since we sell those two items individually for $2 each, plus all these extra printables, many suggested I charge at least $15 for this – but heck no!!! I want this to help as many as possible (though I do still have to support my family, of course, otherwise I could list it for FREE) so here’s the deal…..
Nab this ENTIRE set – including the bonus items – for just $2.99 HERE!!! Even if just SOME of these would make your life a bit easier, that all seems worth it – don’t you agree? I mean, parenting is crazy enough, so even the slightest bit of help can be a huge blessing! Whether you use ten of these sheets or ALL of them, I just hope they bring a little more ‘calm’, organization, time and relief to your family’s busy lives! I was getting so sick of the stinky shoe problem in our house – I mean, with an active girl and three VERY active boys (plus hubby and me, yes) there were a lot! I tried a few different things, but this one trick is the best way I found to Get the Smell Out of Shoes – and I’m sharing it with you. Our dogs have gotten into this nasty habit of chewing on shoes (and everything else, for that matter) and because of that we now have to keep all of our shoes behind closed doors. We put a shoe rack in our under stairs closet for those we use regularly. The bad thing about that is the stinky shoe smell really fills up that closet. It’s pretty spacious – but it’s also a lot of shoes! Like I said, we tried several things – but only one made enough difference to make it worth it. The great thing about it is that it doesn’t take much stuff, or money! In a bowl, mix a few cups of kitty litter with a few tbsp. of baking soda. There’s no ‘exact’ measurement, so just roughly. Mix it up well. Scoop some into each stocking/sock. Tie the end off so it doesn’t spill. 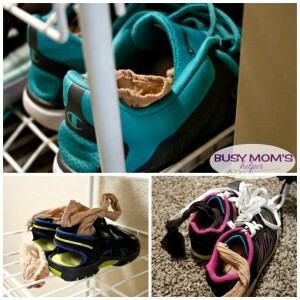 Place one inside each shoe when not being worn. Throw away when done! Note: for the stockings, some baking soda dust may come through the fabric – but just shake the shoes. I found they kept the kitty litter in just fine, though. This isn’t a solution that’ll last forever, of course, because we continue to wear our shoes. I’ll probably do a 2-night round every couple of weeks, as needed. I’m just so glad I don’t open that door and have to plug my nose! Y’all know how much we love our dogs, all four of them. They complete our family, and provide plenty of snuggles, loves and goofy moments – that being said, they also provide quite the mess in our home! All that shedding and the paw-prints really can be frustrating, but luckily it doesn’t prevent us from enjoying our furry pups! Here’s some ways Pet Clean Up is Made Easy so you can focus on the GREAT things about pet ownership. If you’re like us, you’re among the 59% of pet owners who feel that their pets help make their house feel like a home. It just wouldn’t be the same without them, so it’s a bit sad that 70% of Americans (and 75% of pet-less parents) say that their concerns over pet messes may prevent them from adopting a pet. Now, I know there are some really great reasons out there that pet ownership may not be for you, but I hope I can show you how the messes shouldn’t be a large factor in that important decision! 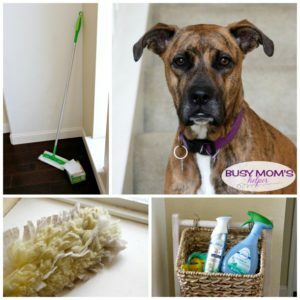 Having had dogs for over 5 years now, we’ve learned how to make the clean up not only easy, but QUICK – because busy parents like us just don’t have a lot of time to be cleaning – but even the savviest pet owners may need help to see why they shouldn’t sweat it when it comes to their furry friends. Since we’re making a pledge to stress less about the pet hair all over our floors this year, and handling it quickly and easily instead of making it a huge hassle, the first thing we’re doing is dividing up the work. Each week is someone else’s turn in our home to do the floors, while we also rotate dusting (especially the stairs – because boy does the dog hair like to collect on there!). For the stairs, ledges and baseboard-type spots we love how quick (and fun, according to my kids) the Swiffer Dusters Heavy Duty Pet Refills work. The floors were the biggest stress, but luckily we tackle that easily now. Whoever is in charge of the floors for the week just pulls out our Sweeper Dry and Wet and the Pet Dry Refills with Febreze Odor Defense (that are amazing, and Trap + Lock all that dirt and pet hair – you can find them at Kroger) and sweep away. It’s actually kind of fun to watch them do the swishing, back-and-forth motion with it! After that, for the dirty pup prints, the Wet Pet Refill works amazing at wiping those up in a jiffy, leaving our pretty floors shining. Plus, the tough green strip is perfect when there’s a spot that needs a little extra scrubbing. I love it! 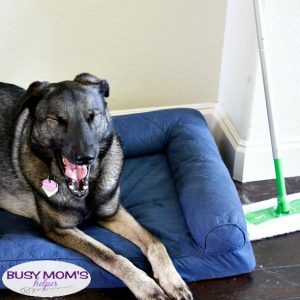 Being a pet owner, I know there will always be a mess (plus kids – so there’s that!). 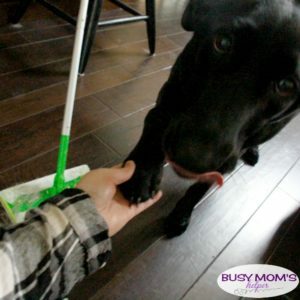 When we first got a dog we had to spend a ton of time cleaning all the dog hair and paw prints, but we don’t mind at all now because with Swiffer it’s so quick and simple! Now that we spend less time cleaning up after our pets, we can enjoy a lot more time with our family – including our furry friends! What’s your trick for quick pet clean up? With a family of 7, it can be really challenging to keep all of our schedules organized (and not forget all the random events or tasks). Luckily, we spent the weekend putting up this awesome Family Home Command Center that’s been a lifesaver! Not only is it functional, but looks amazing on this big wall on the side of our stairs. As we’ve been *finally* adding photos and decor to our walls in this house (like our fun entryway with our new family photos), I knew I wanted a central area to help keep our family a bit more organized. 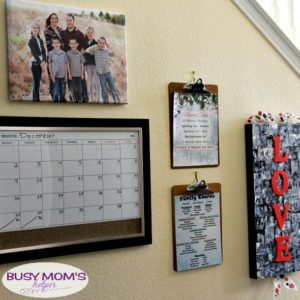 A big dry erase calendar was a total MUST for me, because as the kids get older there seems to be more and more activities every month – I need help to stay on top of it all! And for those of you that are super observant, yes I completely messed up the dates on the calendar at first! My large desk calendar – where I put all my daily to-dos for work, life, and EVERYTHING – starts with Sunday as the first day of the week. I look at this calendar multiple times a day, so that’s what my brain is programmed for – so I went into autopilot when writing in dates. It’s since been fixed, thank goodness, but it’s going to take some getting use to! At the top is another of our fabulous family photo gallery wraps – it’s a bit more goofy, and I love it for our command center. It took me a bit to decide on a layout – but once I knew exactly WHAT I wanted to put on the wall, it was just a matter of playing with it. I traced everything onto scrap paper and used that taped to the wall until I found what I liked best, then it was easy to put the nail holes exactly where they needed to be, as well! We’ve been trying something new with our family chores – a sheet with the chores divided up. I laminated it, so each week I just put each child’s marker color by the chunk of chores that they’re in charge of completing that week. Same for who has meal duties (set table, etc.) each meal – just add their marker color. Super easy to switch up, and a nice convenient spot for them to check! Above that is a cute printable list of the morning tasks all my kids need to complete to kick off their homeschool work for the day – I plan to switch it up each month to play with other backgrounds. I’ve had my large photo collage LOVE board for several years now, and have always enjoyed it in a central location to look at often, so it was perfect! I plan to start making a new one annually with our family photos from that year, then use numbers to do a vertical 2018 (or whatever the year) in place of the letters. Each year we’ll add to our collection, and the most current will go in this spot on our home command center! Aren’t my babies so cute? Even the kids really enjoy walking past this and seeing a bunch of photos of the family. This family command center is along our main pathway from the front door to the back of the house where the kitchen/living room are. Across from the wall is the large, open office and homeschool room, so it’s a perfect location for them to check their daily tasks and glance at the family calendar, as needed. Seriously, I can’t get enough of how great this central area looks – and am loving how convenient it is for our family scheduling, tasks, and chores. Hopefully it continues to keep us a bit more organized for a long while to come! Do you have a command center? Tell me about it in the comments! 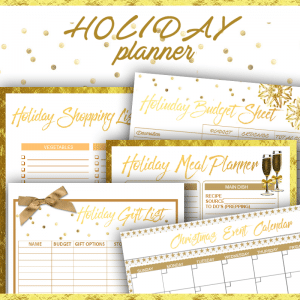 I can’t believe how fast Christmas is coming – but don’t worry, it’s not too late to get your holiday organized with our fabulous, festive Printable Holiday Planner! We’ve got everything her to help you keep your sanity during this busy season – from event calendar, to shopping lists and menus! Just sign up above for our newsletter to gain access to lots of fun printables and even some discounts throughout the year on many of our products! Sponsored by One Hour Heating & Air Conditioning® service providers. All thoughts and opinions are my own. Since moving to Texas, we have owned two newly built homes – this meant everything was new, from the walls and paint to the HVAC systems and windows. Our most recent home purchase, though, is one that’s almost 20 years old – so things aren’t fresh and shiny, or functioning at their best. While we really love this house, we’re having to learn some maintenance and care things that weren’t even on our radar before! If you’re in the same boat as us, here are some Tips for Owning an Older House that we’ve learned that may help out. The local One Hour service provider is part of the Direct Energy family of brands, with independently owned and operated locations all over the country. That means you get local service, backed by a national brand! Their service is backed by an on-time guarantee, and even endorsed by UWIN® (that’s a consumer service resource that lets home service contractors provide a nice, extra level of protection – as well as peace of mind to residential consumers who actually get the services). To find your local One Hour service provider, check out their website or call 855-One-Hour. Our technician, Shane, showed up and was very professional and friendly. He handled all of our not-so-knowledgeable questions and concerns, then took a good, deep look at all the aspects of our HVAC system. He definitely knew his stuff, which shouldn’t be a surprise since the One Hour technicians receive ongoing HVAC training. 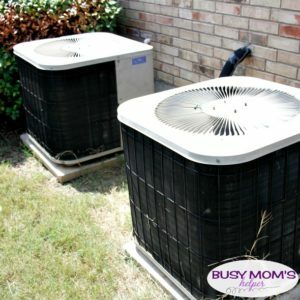 They’re thoroughly skilled to address any HVAC issue, and get you back to feeling comfortable inside (especially if you’re in this Texas heat – dang!). Everyone can appreciate a properly-cooled house – even this cool dude! Honestly, I was a bit concerned about what type of technician would show up at first, but I should’ve known that One Hour service providers ensure you’ll be served by a reliable professional who’s not only well-trained and skilled, but also clean, courteous AND background-checked. This was HUGE for me, as a parent, when it came to someone coming into our home! Keep an eye on drains and pipes – you don’t want them blocked! Stay alert for signs of foundation issues – doors getting funky in the door frames, corner cracks from settling, etc. This is something you want to catch early on! What are your best tips for owning an older house? Supporting our kids at home can really help their success at school, especially as they get older and into higher, more challenging grades. One way we can provide that help to them is having things organized in a way that makes homework and study time less hassle – and maybe even more fun. 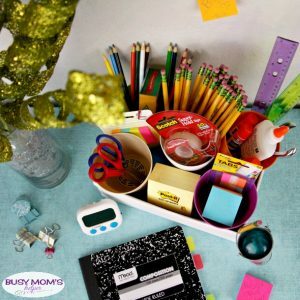 We put together this organized and colorful Homework Station for Teens & Tweens as we’re getting nearer to the start of the school year, and stocking up on all of the essentials. We’re even showing you how to make this super simple DIY Pencil Caddy! Back to school shopping can be stressful, which is why I make sure to plan ahead and go early before the rush. Walmart always has what I need in just one stop, which is a huge sanity saver! Not only that, but be sure to check out their specific Back-to-School section so you don’t have to wander all over the store to grab everything you need for your students. From my experience, teacher supplies lists can be a bit generic – which is fantastic in finding what you need and covering all the basis – but be sure to stock up on the items you’ll certainly need plenty of for the school year, such as Scotch® tape or Post-it® Original Pop-up Notes. I go through a TON of them all year long, and love that I can keep a good stash of them to pull out whenever. My tweens have started using Post-it® Notes Cubes and Post-it® Tabs a lot, using them to mark pages in their books (without the worry of leaving marks) or planners to help them stay on track and more organized. Of course they LOVE leaving little memos and friendly notes all over, too – but I’m all for it if it makes learning time more fun for them! Note: If you’re using a box, make sure the top flaps are removed first. Decorate the box/container. For ours, we just used some sturdy paper (like construction or card stock). Your teen/tween can even decorate it beforehand, if they want! Start with a strip on the four outside corners, just so they are covered neatly. Next, size pieces of paper to cover all the outside sides of the box. Fold over the top and bottom and smooth out, then use Scotch® Super Hold Tape to secure it into place. If you want some depth to for your containers, use tissue paper to build up the bottom (we put the back row of containers higher than the front, just because we liked the look of it better). Place your containers, then fill with all of your student’s school supplies! See, I told you it was really simple – and it’s a great way for them to customize their supply box, making it a bit more enjoyable when it’s time for them to tackle homework or study. We filled our containers with pencils and other supplies to help them, then set up a nice area for them to store it until needed. I’m pretty relieved that I thought ahead this year instead of waiting until the last minute – but at least I know I can always grab everything my kiddos will need for back to school during my regular Walmart trip – because I almost always forget something! Be sure to go here more Back-to-School Inspiration & Help! I’m not ready for summer. Yes, I’m excited for the kiddos to be home (although nervous for how to still fit in work/to dos of course) and trying out the pool in our new house, hitting the zoos and all the fun that comes this time of year. That being said, there’s some important things that need to be done around the house that I’ve been neglecting. 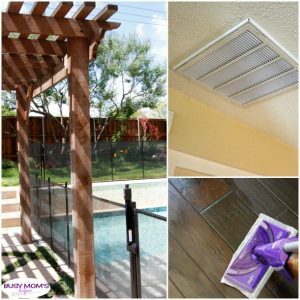 If you’re in the same boat, here’s some tips for Getting Your Home Ready for Summer so we can ALL be a bit more prepared for the coming season! Since we’re going from cold (some places FREEZING) and wet to hot and mostly dry, it’s important that we get our home ready for summer and the weather it brings with it. A few tasks now can not only save time and frustrations later, but possibly even money! That’s right, some things mean energy savings when the heat strikes – and I’m a huge fan of saving on our budget! Check Your Air Conditioning: Make sure the units are functioning properly, the ducts are cleaned out (you don’t want settled dust and yuck from the winter months blowing into your house) and air filters are replaced as needed. Check for Leaking Energy: All that cool air you’re paying for can escape from little spaces on windows, door gaps and other places. Check around for spots that may need to be re-caulked and fix or add weather stripping as needed. Be Ready for Nature: Warm weather means grass, plants and much more outside time – meaning it’s going to get tracked in onto your floors. Have a convenient spot for your cleaning supplies, such as your handy Swiffer products. 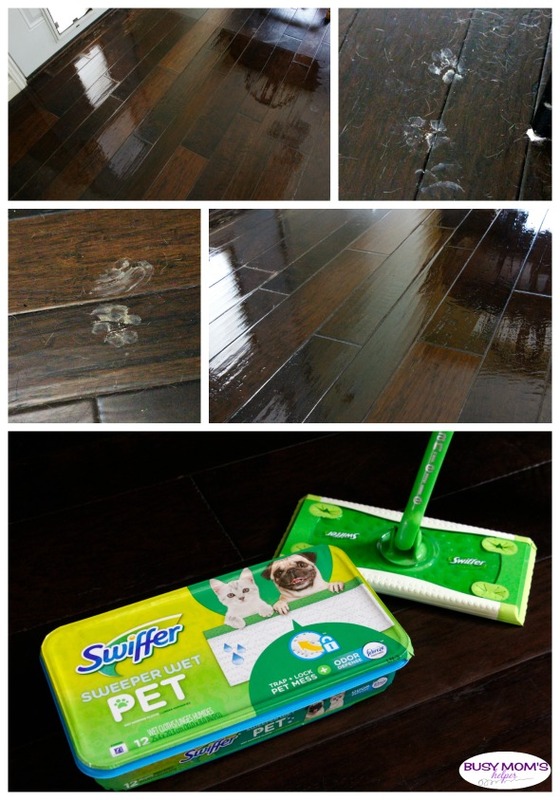 I use my Swiffer Sweeper daily to get all the pet hair and grass the dogs drag in, and the Swiffer WetJet is perfect for keeping the floors clean of pawprints (and kiddo foot prints, of course!). Check Your Dryer Vent: This is often overlooked, but it’s crazy how blocked up the vent for your dryer can get. Now is a good time to clean that out for better air flow! Prepare for Bugs: I hate bugs – like REALLY hate bugs. Whether you’re the type who sprays to prevent too many in your home, or just like to make sure there’s not cracks or crevices they can get in at, make sure you get that handled soon. Give Your Plants Attention: Time to prune your trees, check your plants, and maybe even prepare your garden area. You don’t want to be out there doing a TON of work on them during the mid-summer heat, so tackle it now. Change Your Ceiling Fan Direction: I had no idea that ceiling fans can go different directions, and that it mattered depending on that season until a friend mentioned it randomly! It turns out that during the winter, fans should go clockwise to better distribute the heat that rises – but in the summer they should rotate counter-clockwise (at higher speeds) to get a good breeze going in your home. Switch Out Your Winter Items: From your winter coats in the closet, to snow blowers in the garate – it’s time to get those put away. Things like cute t-shirts and shorts should be brought back out from storage, as well as your outside items like lawn mower, weed wacker, gardening tools, etc. Check the Deck: Many decks or patios need to be resealed every so often, so now is a great time to check if yours is due for it. With how much time may be spent out there this upcoming season, better have it in great shape to fully enjoy! If you haven’t tackled your Spring cleaning yet, it’s never too late – and I for one love starting off the summer break with a really clean house, because heaven knows I’d rather spend the summer enjoying my family than more-than-normal cleaning. Luckily it’s then super easy to maintain with the Swiffer Sweeper and Swiffer WetJet – and it helps that the kids think it’s great fun using these so are more than happy to help out! What do you do to get your home ready for summer? I have no idea how the whole ‘spring cleaning’ thing started, but I’ve always loved the idea of doing a major deep clean and organizing of my home at a regular-ish time each year. That way I know it’ll get done, and it makes our house feel fresh for the coming seasons. On a whole extra note, Spring Cleaning for a Move not only gets that job done, but also helps save time and hassle later when you’re switching houses! I’ve shared some of my tips for Spring cleaning before, and today I’m sharing a few more – plus how it’s a great time when you’re also planning a move. As many of you know, we recently put our house on market to down-size a bit. We love our current house, but it’s just TOO big and pricey for us to stay in. So part of the preparation before we sell and move, is to purge a bunch of unnecessary stuff. It’s far too easy to collect ‘stuff’ when you have a big house, so by going smaller we can declutter. The first step to decluttering for your Spring cleaning is to go through all the obvious places – closets, pantries, under stairs, shelves, drawers etc. Sort through your clothes and decor, your dishes, even the tools and supplies in the garage. Decide what you really need/want to keep, and what would be best to get rid of. Make a bag or box (or multiple, if you’re really trying to get rid of a bunch of things) for donations and also for garbage/recycling. Now check the less obvious spots – in couch cushions, up high on the kitchen cabinets, and the like. Really go through and do a good check for any place items may have been shoved or collected. After that, you should have your excess or no-longer-needed items ready for either disposal or donating. You’re now ready to start your deep cleaning – but don’t worry, it doesn’t have to be a huge project! I kind of make a list of everything that needs to be done, then check off things one room at a time so I don’t lose track of where I left off in case I’m interrupted. Dust everywhere – don’t forget those hard to reach places like ceiling fans, high ledges, light fixtures and blinds. I love using my Swiffer® Dusters™ (my kids also LOVE cleaning with this, so that’s a bonus for me!) because they easily trap the dust, dirt and other fluff that accumulates everywhere. Wipe the baseboards well – those can sure get icky! Sweep all your non-carpet areas – our Swiffer® Sweep + Vac™ is my hubby’s favorite, while I’m more into the Swiffer® Sweeper X-Large™. Either one is great, as they do excellent at collecting the junk on our floors – including the ridiculous amounts of dog hair! Mop all non-carpeted areas – I’ve used the Swiffer® WetJet™ Mop since I was younger at my parent’s house, and now rely on it for my own home. For our wood floors, the Swiffer® WetJet™ Mop Wood Floor is excellent for our nice wood floors in our office and family rooms. It may seem like a LOT, but it’s actually not that much for an extreme deep clean once or twice a year – especially with the right tools to help you get the job done, as well as a family to help with all the jobs! Adding in the decluttering aspect is excellent for if you’re preparing to move because it 1) makes yours house appear nicer for selling, 2) makes cleaning easier, 3) gets rid of stuff so you have less unnecessary stuff to move and 4) makes stuff more organized so packing is easier when moving day arrives. What is YOUR big Spring Cleaning item?